Appearing on CBS This Morning on Thursday to announce a partnership with Under Armour for space apparel, Virgin Chairman Richard Branson laid out a timeline for the completion of SpaceShipTwo flight tests at the Mojave Air and Space Port and the move to New Mexico. Branson, who has spent 14 years making schedule predictions the majority of which haven’t come true, plans to be on the first commercial flight out of the $225 million, taxpayer funded spaceport outside of Truth or Consequences. The schedule appears reasonable. However, it assumes that nothing serious goes wrong with the rest of the flight test program, which involves Virgin Galactic’s only operating SpaceShipTwo, VSS Unity, and the sole WhiteKnightTwo carrier aircraft, VMS Eve. Flight tests are specifically designed to find problems so they don’t occur later during operational launches. Last year, testing was held up for about two months after engineers found a crack in a major structural component of SpaceShipTwo. It’s not known how they addressed the problem, but VSS Unity flew a successful flight above 50 miles on Dec. 13. Meanwhile, Virgin Galactic’s main rival for suborbinauts, Jeff Bezos’ Blue Origin, has shifted the schedule for flying people aboard its New Shepard spacecraft from early to late this year. It’s not clear why this decision was made; however, Blue Origin has repeatedly delayed the start of crewed flights aboard the system. On Wednesday, New Shepard flew its 10th suborbital flight from the company’s facility in west Texas. The vehicle carried eight payloads sponsored by NASA’s Flight Opportunities Program. Blue Origin has not yet started selling tickets to the public or announced a price for rides. Virgin Galactic’s 600 or so ticket holders have agreed to pay $200,000 or $250,000 depending upon when they put down deposits. Branson has said the price will go up for new reservation holders. SpaceX has (had?) about 6,000 employees, not 600. They laid off about 600. 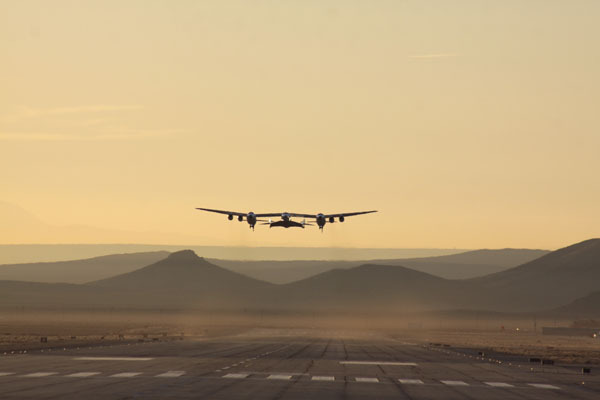 Stratolaunch is laying off 50 minute? Do you mean 50 percent? Get some sleep, Doug. In the meantime I promise I’ll keep fighting with RGO, Andrew T. and windbourne in the comment threads of stories you’ve already posted. No 50, these are very small firms. It looks like VG is not going to build a second SpaceshipTwo. Guess they figure they will cover the existing ticket holders with only one. I seem to recall they were going to build 4 SS2 and another WK2 at one time a long long time ago. I recall similar estimates. You assessment would make sense also. I seem to recall there was a second SS2 said to be nearing completion and a third that had at least had its keel laid. Maybe the intent is to finish the second one and scrap the third. With only two SS2’s in the fleet, a single WK2 should suffice. I can’t say that pursuing such a course would exactly fill me with confidence if I was one of VG’s ticketholders. Do you pay proof readers Doug? However it makes sense if you think about it. Even if they fly only once every week or so they will still work through the inventory of ticket holders fairly quickly compared to the long time they spent developing it. They will then be able to claim “victory” and shut it down. And if they lose this SS2 they will probably end up shutting down anyway from the PR that results. Given that it is difficult to see what value another SS2 would bring to the venture. Given that Sir Richard Branson is probably going forward just to save his reputation on space tourism (the business case for SS2 ceased to make economic sense years ago) it makes sense not to dump more money into the money pit than is needed. Fixed. Numbers in story are correct. Maybe. But Mr. Branson isn’t exactly well-known for resisting the sunk cost fallacy in making his decisions. If there’s a second SS2 nearly complete, I think VG will finish it. Okay, Lee – you rat barstid you – I’ll add you to the list. Doug needs $ to run this. RIght now, he does a lot free work on this, pretty much by himself. Are you volunteering to be the proof reader? I am sure that Doug would love to have help, as opposed to criticism.